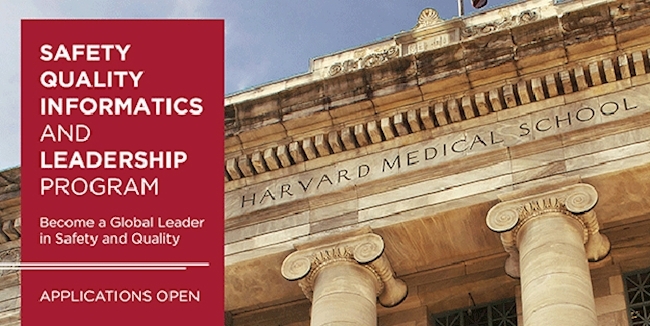 The Harvard Medical School Safety, Quality, Informatics and Leadership (SQIL) program is a 12-month certificate program designed to develop knowledge and skills in patient safety, quality, informatics and leadership for health care professionals working in a hospital, outpatient or health system setting. The ultimate goal of our SQIL program is to train the next generation of leaders in health care. What makes the HMS SQIL program unique is the international student body and the blended learning format, which combines online learning and face-to-face interaction through three in-person workshops at convenient cohort locations across the globe. The workshops focus on active adult learning and involve medical simulation scenarios, case-based exercises from Harvard Business School, robust discussions and small-group exercises led by national and international thought leaders. Between the in-person workshops, students join online modules, participate in interactive faculty webinars, complete and present team assignments with their peers and undertake a final individual capstone project. This blended learning format involving an international, multidisciplinary student body creates a global community of learning. Medical doctors, nurses, administrative leaders and policymakers are encouraged to apply.